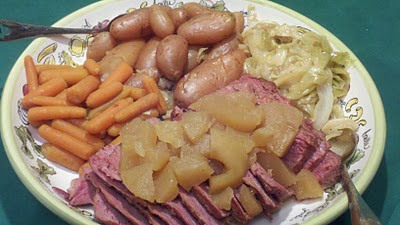 It just wouldn't be St. Patrick's Day without corned beef and cabbage, am I right? Now, I could take a corned beef brisket, throw it in a pot with some potatoes and cabbage, cover it with water, and then boil the hell out of it, but I've decided to go in a different direction. I wanted to cook it in a crock pot, (with potatoes and cabbage, of course), but I wanted a different spin. Then I thought of adding apples, because I usually add diced apples to sauerkraut or anything cabbage. So I used those ingredients as a springboard for my recipe search, switched a few things around, and now here we are! This recipe couldn't be easier because you just throw everything into the crock pot and turn it on. And just wait until you taste it! It has that same sort of sweet and salty dynamic as ham and pineapple. Come to think of it, you could probably do this exact same recipe with ham and pineapple instead of corned beef and apples! SO yummy and so simple!!! Even if corned beef isn't high on your list of favorites, I think you should give it a try. This recipe just might change your mind. I'm just sayin'! Place all ingredients in a large slow cooker (cut meat in half if necessary). Btw, if your brisket is packed with a seasoning packet, you can either discard it or save it for something else. Stir gently to mix. Cook on LOW for 8 to 10 hours. Remove meat and vegetables and some of the meat juices. Slice meat thinly across the grain. Serve with vegetables and a drizzle of the juice over the top. If you don't have a crock pot, you need to stop what you're doing and go and buy one! In the mean time, you can make this recipe in the oven. Just place the everything in a large heavy pot or cast iron Dutch oven, then cover it and bake it in the oven at 350F for about 2 hours or until the meat is fall apart tender.